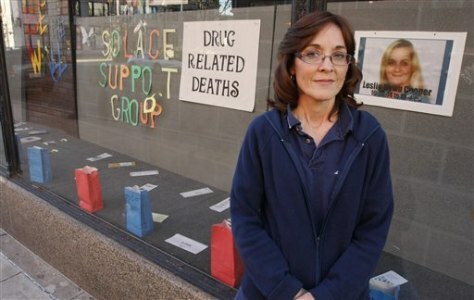 Lisa Roberts, a public health nurse at the Portsmouth City Health Department, stands in front of a storefront display in Portsmouth, Ohio. Nearly one in 10 babies were born addicted to drugs last year in southern Ohio's Scioto County. Admissions for prescription painkiller overdoses were five times the national average.